Thanks to its combination of colours (how does the rhyme go again... yellow, black, red and green should never be seen?) this Watford shirt shouldn't work. The fact that it does, even as it teeters on the edge of an horrific colour clash, is testament to its greatness. Sponsor's logo aside, the kit is one of pure class and is another one of those designs that’s proved to be a forerunner of today's outfits thanks in main to the brazen red and black colour bar placed prominently across the chest, divided neatly with a thin yellow stripe. Quite a difference from the kits of the day that, in the main, featured just one primary shirt body colour. It was a superb Umbro design that wasn't widely taken up by their roster but later, quite rightly due to its very effective way of accentuating a team’s colour scheme, found life in their teamwear catalogue. Although recent years have seen Watford favour simply yellow and black as their primary colour combo, for me a large dollop of red (as was the clubs penchant in the '80s) is what really makes a Watford strip really buzz although arguably it doesn't sit comfortably with the yellow and black implication of the 'Hornets'. The jersey also features that trademark of many mid-80s designs, namely the multi-trimmed V-neck and cuffs. In this case, the fact that the neck and cuffs are the same colour as the shirt just adds to the glamour of the jersey. 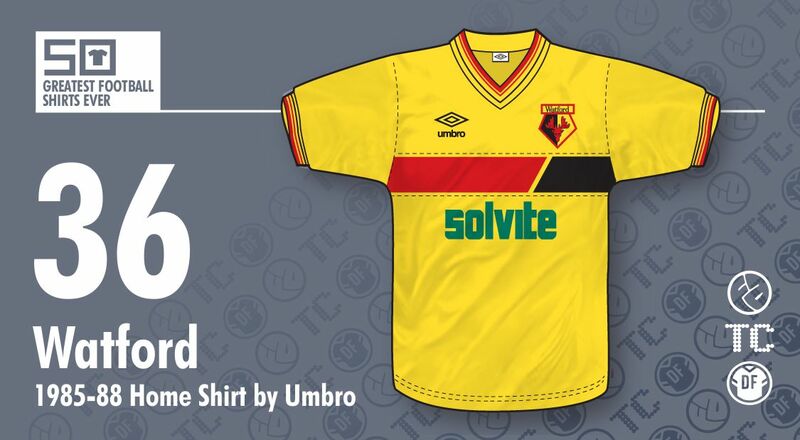 Glamour - with all due respect, not a word you’d generally associate with Watford (apart from the patronage of Sir Elton, of course), but prove what benefits and strength a well considered and carefully designed strip can bring to a team's visual identity. Back to the sponsor though... As mentioned earlier, in theory the inclusion of the Solvite logo in its corporate green should spoil the shirt, but in my view its this colour clash that helps give the shirt an added dimension. And it should be remembered, of course, that most shirt sponsors logos in the early-mid '80s were simply adapted to fit in with the colour scheme of their host team. Thanks to this brave colour decision, all parties manage to come out of the deal with their visual identity and integrity intact, plus the sponsor gets maximum stand-out on the shirt (just imagine how a black logo would have visually disappeared under the chest colour bar). Time can often change opinions of the aesthetic decency of a football shirt, though. At the time of its launch, its possible that the green Solvite branding may have upset supporters as interestingly it appears replicas were sold mainly without the Solvite logo. Their loss! Written by John Devlin, founder and illustrator of TrueColoursFootballKits.com. John can be found on Twitter and True Colours is also on Facebook.